I have started making and uploading tutorial videos to YouTube. This is the first attempt, and while it is a bit dry, I think it gets the point across. When designing injection molds, it is very often desirable to use pneumatic cylinder to move objects, or act in place of springs. Pneumatic cylinders are used to separate plates, move side-action components, create false breaks, and much more. Because they are used so often, and I try to make engineering easier and faster, I have included a feature in the software for doing these calculations. The pneumatic cylinder size calculator sizes the piston so that the force generated is twice what is actually needed. If the force is too low, the movement is sluggish due to being underpowered. If the cylinder is sized to large for the application, the object can also move too slowly because an excessive volume of air is needed to operate the cylinder. You will also notice that the return force is always less than the forward force, as there is no air pressure acting on the area where the piston rod is located. As with all feature in DZynSource Mold Engineering Software, the calculation is available in both Imperial and SI units (inch or metric). 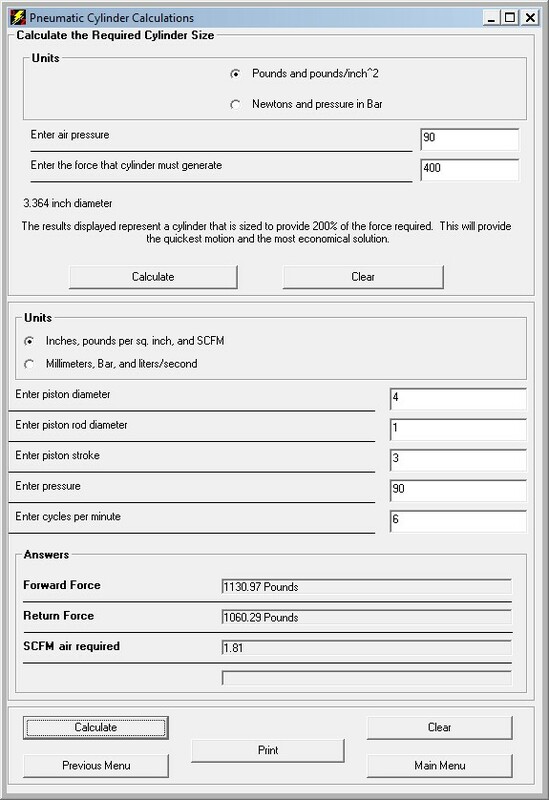 I have also included the scfm calculation needed for valve sizing when working with pneumatics, as this is usually a consideration that needs to be, or should be, calculated or measured. The metric calculation returns the air volume in liters.